As Africa Directions developed, it became apparent that its focus should not be restricted to prevention activities, but the needs of the youth currently frequenting the centre. Many of the youth come from homes affected by HIV and AIDS, and some are HIV positive themselves. From 2004, AD has been running a unique programme to support and advocate for children who are living with HIV. 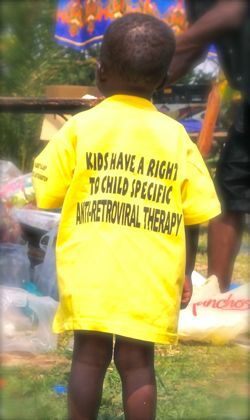 The main aim of the programme is to give social and psychological support to children living with HIV, encourage disclosure and open communication between children and their parents, fight stigma, and ensure that these children are knowledgeable about their condition so that they can remain healthy and happy for the greatest period possible. Children are taught the importance of adherence, good nutrition and hygiene, and other positive living skills. The programme provides children with psychosocial support so they understand HIV is something they must live with, but it does not make them different or less important than any other child. With support from Elizabeth Glacier Pediatric AIDS Fund, Africa Directions now supports and works with 16 children who are living with HIV, ranging in age from 5-16 years. They meet at the centre twice a week with a mentor, who is also positive, and trained in psychosocial counselling. Many of these children are orphaned by one or both parents, so they have a lot of stress and worry in their day-to-day lives. At AD, these kids are able to relax and play with other children while also learning about HIV in a non-threatening and conducive environment. Their trusted mentor gives them the care and support; he encourages them to always be positive and have faith. The parents are also invited twice a month to learn how best to care for themselves and their children. With the positive response to this unique program, AD and Elizabeth Glacier have seen the deeply unmet need for child support groups and plan to extend this program in the coming years.